Aluminum Vs. Vinyl Windows | Soundproof Windows, Inc. 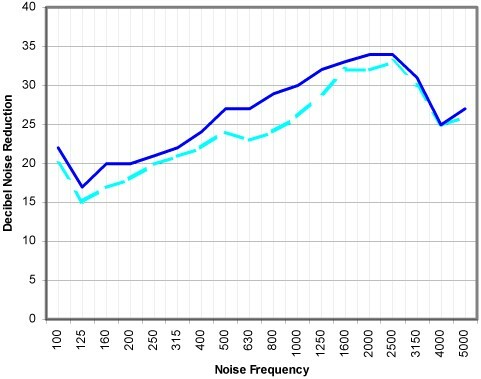 Which is Better for Noise Abatement? Vinyl windows have certainly become popular over the past fifteen years for residential uses. They do have advantages over aluminum window frames in general when used as the main window or “primary” window. When used as the second window (“secondary”), many of the advantages disappear completely – largely because the primary window provides the basic window functions and advantages. Secondary windows are used to improve the insulation values of the primary window, and, in the case of Soundproof Windows, they are used to stop noise. Vinyl and wood windows now have well over 70% of the residential window market. Aluminum windows have the overwhelming market share for commercial buildings. Aluminum will always outperform vinyl where noise abatement is concerned. Vinyl has no mass and has to be too thick to perform the same task that aluminum does. As a primary window, aluminum will usually do a better job of stopping noise than a vinyl window. The lab tests and graphs below prove this. These numbers are taken from lab tests by Riverbank Acoustical Laboratories, a nationally recognized testing company. 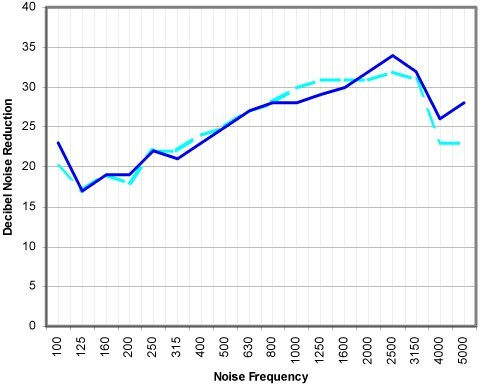 The tests were part of a large study of noise-stopping capabilities of glass and are often referenced by acoustical experts worldwide. All three tests are for different sets of windows of similar style. More details of these tests are available upon request. All three sets of window tests show that aluminum stops more noise than vinyl windows. In the third test, where the results are almost identical, the vinyl frame is substantially thicker and is probably the reason for the good performance. In the second test, the inherent problems of dual paned glass likely contribute to degrade the vinyl window performance. Most window companies do not know much about noise. 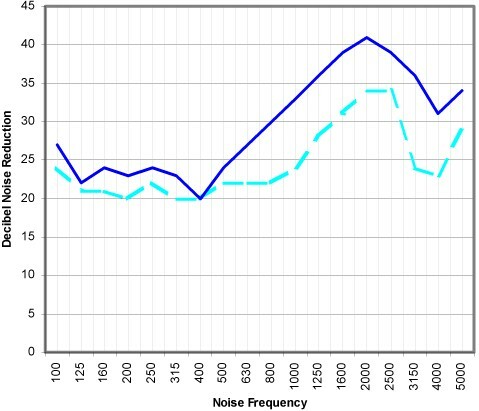 Many who claim to have noise abatement windows do not even know what they are talking about. Many assume that vinyl is better because it is more popular, or it is what they sell. They often claim that because aluminum can transfer noise, it is worse than vinyl as vinyl does not transfer noise. This is simply ignoring the test data out there for everyone, and is a foolish conclusion, because of lack of understanding, or is it because vinyl is what they sell? Aluminum can, by itself, transfer noise. When applied to a normal standard window, it does not. When properly used in a noise abatement window, it actually will stop even more noise than could be transferred. The principle is the same as the way a wine glass will ring when struck with a fork. It will not ring if you are holding the glass. Well, the aluminum is secured to other things and does not transfer noise either. Aluminum has more mass. Lead has a high mass (weight) and does an excellent job of stopping noise. Aluminum is about three times heavier than vinyl and many times stronger than vinyl. Vinyl gets it strength in much the same way as cardboard is stronger than the paper alone. However, the vinyl has a very low mass and therefore does a poor job of stopping noise. This is necessary in order to gain the strength they need. For noise abatement windows this is even more true. To stop as much noise as we do with our Soundproof Window frames (which are 1-1/8″ thick), there would have to be 3″ of vinyl frame. We have tested this in the laboratory as part of our research. A larger vinyl window frame is not acceptable when trying to stop noise. A thicker frame would mean less airspace between the two windows, and less airspace means less noise reduction. Finally, if you talk to an experienced home-siding salesman, they will tell you that if you want to stop noise, do NOT get vinyl: get steel or aluminum. Perhaps they know what they are talking about.